Loopa News: built with Phoenix, Vue, Vue Router and Vuex. - Vue.js Feed Loopa News: built with Phoenix, Vue, Vue Router and Vuex. Loopa News: built with Phoenix, Vue, Vue Router and Vuex. 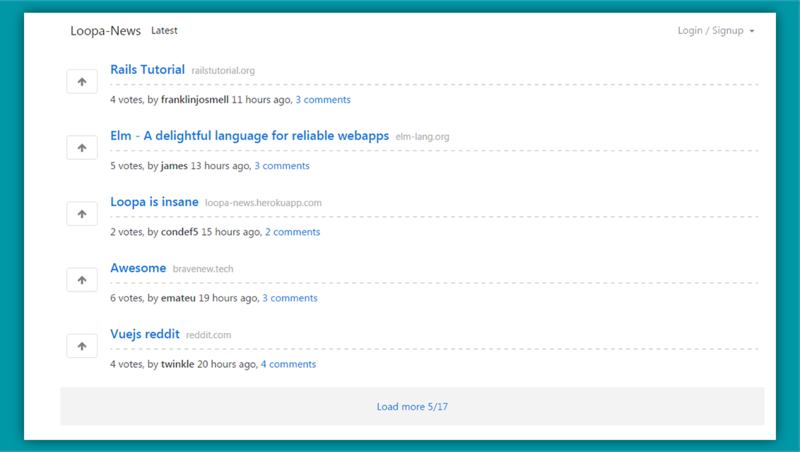 Loopa News is an open source social news app built from scratch using the Phoenix framework, Vue, Vue Router and Vuex. It is inspired by Microscope, a popular tutorial app developed with Meteor. Take a look at the Demo available here. To run this application locally head to GitHub to download the repo, after making sure you have installed Elixir, Erlang, Phoenix, Node and PostgreSQL.